When Lexie Jay and Jon Fedorsen discuss the background of their band, Featurette, the quote from American Pie can begin their story. Yes, that quote. This one time at band camp, Jay and Fedorsen were teaching music. Fedorsen brought along his brother’s acoustic guitar and was trying to spread the message to camp goers that they can step outside of their comfort zone and try a new instrument, just like him. According to Jay, his message was great… his guitar playing, not so much. He recruited her to strengthen the band for a staff performance, but they have yet to stop creating music together. Since then, they traded the acoustic guitar for synths and a drum machine. They went from creating folk music to indie rock before focusing on more electronic sounds. 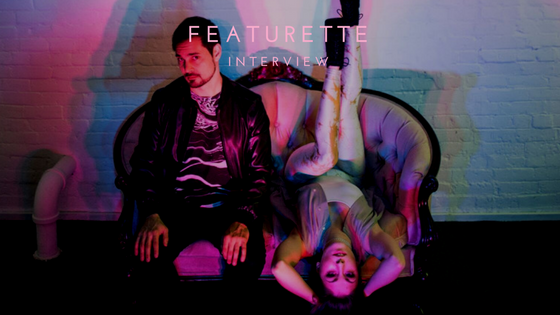 Their first LP, CRAVE, shares a journey of “Featurette Girl”, the main character that embodies their live sets. The lyrics are inspired by both of their pasts, as well as the current state of the world, and are turned into a powerful character arc. The latest two singles, “Bang” and “Upside Down”, pick up where CRAVE left off. Although the songs continue the story of Featurette Girl, the process of creating the songs is a duel effort. A future album is yet to be announced, but Featurette will be playing a part in the 2018 music scene. And to think, their journey together began during this one time at band camp.